Here at Vaccinate Your Family (VYF), we practice what we preach. That’s why I got both a Tdap and influenza vaccine when pregnant with my first child (who is fully up-to-date on his childhood vaccines). Now that I’m expecting my second baby, I didn’t hesitate to get vaccinated again. Why do I choose to get vaccinated? 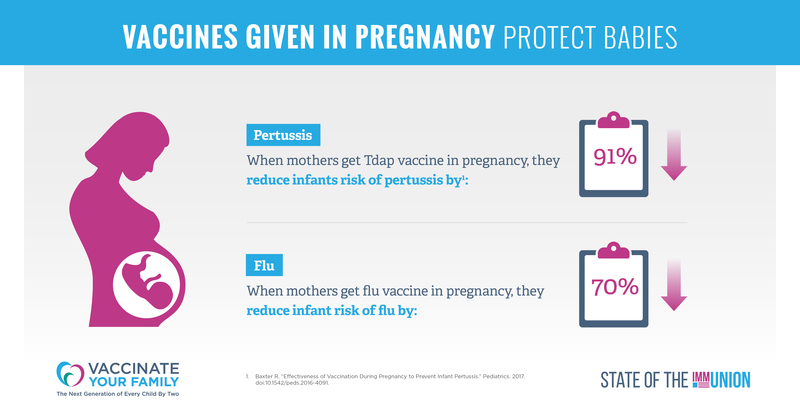 Vaccines during my pregnancy have the ability to protect not only me, but my child as well. Infections such as flu and whooping cough, also known as pertussis, are not just a threat to me. They can also be extremely dangerous, and even deadly, to newborns. Why get vaccinated against whooping cough? Whooping cough is a highly contagious respiratory disease that spreads easily from person-to-person through coughing and sneezing. Symptoms can be less severe in vaccinated people and older children and adults, so adolescents or adults may unknowingly pass the infection onto vulnerable infants. In young children, the cough can be so severe that it can cause a child to gag, turn blue, vomit or pass out. A gasp for air after a coughing fit can sometimes produces a loud “whoop” sound, though it is not uncommon to have whooping cough without producing the “whoop” sound. This intense coughing phase can last as long as 10 weeks. Half of all children who get whooping cough under a year of age end up in the hospital. Some will suffer lifelong complications and one of every 100 will die. Why get vaccinated against flu? Changes in my immune, heart, and lung functions during pregnancy make me more likely to get ill and suffer severe complications from illnesses as compared to non-pregnant women. In fact, as a pregnant woman, I am five times more likely to suffer complications or death from flu compared to non-pregnant women. Additionally, if I fall ill during pregnancy, I have a greater chance of hospitalization, spontaneous abortion or complications that can directly impact the health of my baby such as preterm labor and delivery, and low birth weight babies. In children, the highest incidence of hospitalization due to influenza is among infants younger than 1 year, with those younger than 6 months at highest risk. On average, about 100 children die from flu each year in the U.S. and thousands more are hospitalized. Getting vaccinated during pregnancy also provides my child with protection during his first weeks and months. How do I know vaccines are safe for me and my child? Experts carefully reviewed the safety data of the whooping cough vaccine before recommendation that women receive a Tdap vaccine during each pregnancy. They concluded that the vaccine was safe for both pregnant women and their babies and there is a long list of published safety studies that can be reviewed here. Additionally, science supports the safety of flu vaccination for pregnant women and their babies, and the flu shot has been safely administered to millions of pregnant women over many years. While the scientific community will continue to gather data on this topic, various studies, such as those detailed below, already indicate that it is safe to administer the flu vaccine in pregnancy. For now, flu season is in full swing and I’m off to find a flu vaccine in order to give my child some protection against the disease before he’s born. Hello! Can you please tell me where/how to find the infographic about pregnancy and immunization that is embedded into todayâs post? Thank you! records and may be subject to disclosure pursuant to the Public Records Act (RCW 42.56).